(CNN) -- Generations of standup comedians never saw this coming. John Heffron is one of an increasing number of comedians joining Twitter. To succeed in the industry these days, you don't just need to be good on stage and screen. You also have to nail the art of sending out mini-messages to Twitter "followers." But if your humor is based on storytelling, persona and, you know, the way you say stuff, how can you get hilarious in 140 characters or less? For the pros, it's a challenge and an opportunity. And we want to hear from you. Send the funniest tweets you've ever seen to Levs via Twitter (@joshlevscnn) or post them on Facebook. Craig Shoemaker: I'm on the information super-cul-de-sac. I mean, I'm not so great at this; I'm learning. And I have no friends. I had more friends at my house yesterday for dinner than I have on Twitter. And (Heffron) is the king. CNN: How did you build up your fan base, John? How did you build up this number of followers on Twitter? 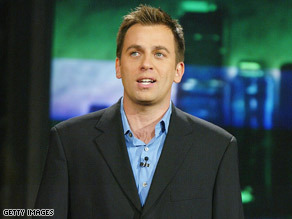 John Heffron: I try to be funny; I try to be entertaining; I try to do stuff that hopefully gets re-twitted. Is that the word? Sure. CNN: All right, let's take a look at some of your popular tweets here. You have a section called the original last tweets. And you have one here: "Guy who always gets killed on Star Trek. Last tweet: 'Got my uniform. The rest of the landing party wearing a different color. Weird!' "
And then my favorite one: "Married man's last tweet: 'About to go into the champagne room, wish me luck.' "
Heffron: Those are the things that end up, people start passing around and then that's what gets people to go, "Who is this guy?" CNN: And Craig, is this what you're chasing? The same idea, those one-liners that get tossed out? Shoemaker: Yeah, I'm a storyteller, so it's not so great for me. I'm still working on this under-140 characters thing. CNN: I did pull out one of yours that I liked too. You wrote, "Up late in my Pittsburgh hotel, just read a USA today article about how Twitter is no good for intimacy. No worries. I'm alone." Shoemaker: I don't know if anybody's laughing at the jokes. I tweeted that last night. We'll see how that goes. CNN: Is that part of what's hard about Twitter? When you're doing this, you don't have that kind of instant feedback. You know, if you're doing standup somewhere, you've got the laughter. How do you know? It's like doing this in an echo chamber. Shoemaker: It's the replies. To me, I judge by the replies. Heffron: I've had zero replies. So apparently, I got to work on my tweeting. The whole thing is, when you write, though, it's different. It doesn't have the nuance or things like that. Like I put something about my ex-wife that I got divorced and "tonight's show is a benefit show and all proceeds go to my ex-wife." And people are writing back, "Oh, I feel so sorry for you," and I go, "No, it's a joke." Shoemaker: Yeah. Criss Angel was on my flight, so I tweeted "Criss Angel is on our flight. We will not have to use fuel. He will use his superpowers to get us home." And the replies were, I spelled Criss Angel's name wrong. It's like, come on, people! How am I supposed? You know, that's not the point! CNN: The previous generations never had this problem. No one's never, until really the last few years, no one's ever dealt with the opportunities and the challenges that you guys have. Is Twitter the new standup? Shoemaker: You know, as a comedian, it's funny now it seems like you have to be funny and be this crazy Internet marketer. How can I let somebody know that I'm coming into whatever city, and Twitter and Facebook and all those things are the best way to do it. Heffron: I hate to see, though, that we're on stage at the Punchline in Atlanta actually tweeting the crowd from the stage. I'm doing my act with my thumbs on my BlackBerry. Hold on for a second; I have a new joke I'd like to try on you. Turn on your texts. Want to follow John and Craig? Heffron is @johnheffron; Shoemaker is @thelovemaster.